It’s been 11 years since HostGator first open for business, and what a great 11 years it has been. They’ve enjoyed the opportunity to offer high quality web hosting services to satisfied customers all over the world – now they want to give back a little. 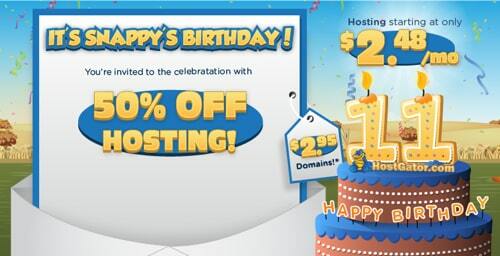 Therefore, they are holding a special, one-day only anniversary sale featuring new domain names for $2.95 and 50% off all hosting packages. The anniversary sale runs from 12 AM to 11:59 PM on Tuesday, October 22. All new orders will automatically receive the discounted pricing offered by HostGator. Please note the promotion is for new orders only – it does not apply to renewals. HostGator.com will no doubt look forward to 11 more years of doing what they do best – offering their customers top-notch hosting services at unbeatable prices. Go see what all the excitement is about by taking advantage of their special anniversary promotion! This entry was posted in Coupons on October 21, 2013 by WHR.